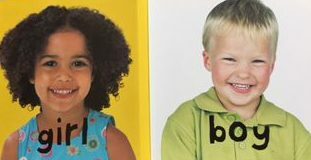 The Fisher Price children are generally only identifiably “male” or “female” based on their hair style. We have three shaggy short-haired children (with the same hair style) and, as a toddler, two of them were designated as “boys” by my daughter, but the other as a “girl.” The adults’ “gender” are distinguished not only by hair style but also by body type—the “women” have curves. Every so often, I would take one of the intended (by Fisher Price) “papis” and say to my daughter, “I am this child’s mommy” in the figure’s voice. Sometimes she accepted it, sometimes she wouldn’t. “No, that’s a papi,” she would respond. I persisted: “But women can have short hair, too, and every person gets to decide for themselves how they want to identify,” I reminded her. My daughter, for her part, has taken issue with the idea that I use the word “hijos” (children) in Spanish to talk about both her and her brother. By reinforcing the idea that my daughter gets to decide how she wants to be called, I hope she will be better equipped to challenge sexism, heterosexism, homophobia, and transphobia (and racism).